Empower your advisor sales channel to effectively guide and inform investors. Shrinking Planet has developed a secure, self-service online resource tool that lets investment advisors intelligently compare, select and present the products that best fit their clients’ needs. The tool easily benefits sales professionals seeking to better service an existing book of clients or those looking to generate new sales from identified prospects. 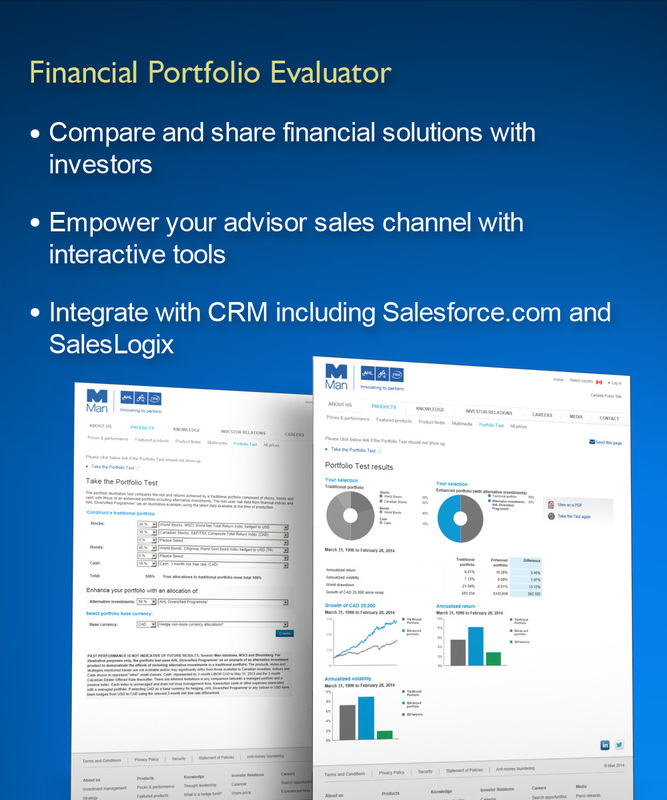 The Financial Portfolio Evaluator is a simple, yet powerful tool to build and manage client accounts, make smart recommendations and leverage the marketing power of transparent, involvement-based multimedia email reach to prioritize, manage and close more sales opportunities. From an organizational view, the sales channel resource center is a fully scalable, closed-loop marketing and sales information solution that provides invaluable managerial insight into how your products are being evaluated, presented and sold through your sales channel. All this can be done in an environment that can be fully integrated with most leading CRM applications including Salesforce.com and SalesLogix.